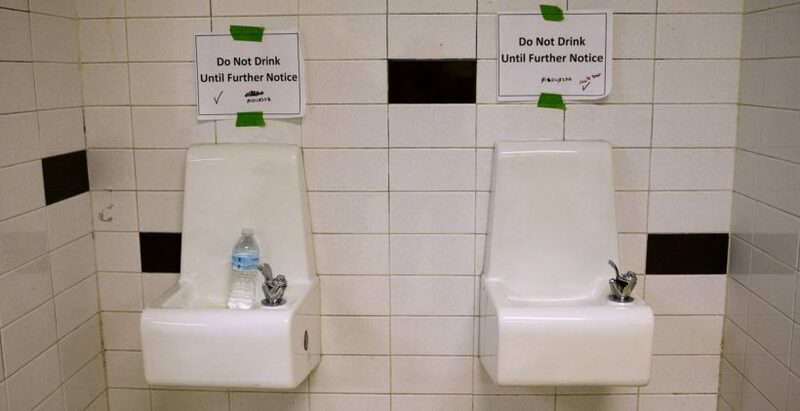 Drinking fountains are marked ‘Do Not Drink Until Further Notice’ at Flint Northwestern High School in Flint, Mich., on May 4. The city’s residents still face an ‘immediate danger’ from lead contamination, a federal judge said Thursday. NOTE: Flint’s water became contaminated after the city began using the Flint River as its water source in April 2014 and failed to add chemicals to prevent the corrosion of aging pipes and plumbing fixtures that began leaking lead into the drinking water. Residents were told in October 2015 that the city water was unsafe to drink. (by Kris Maher, The Wall Street Journal) – More than a year after Michigan officials began addressing lead-tainted drinking water in Flint, a federal judge ordered that the state and city must deliver bottled water to residents because they still face an “immediate danger” from lead contamination. Judge David Lawson of the U.S. District Court for the Eastern District of Michigan issued a preliminary injunction Thursday requiring the delivery of four cases of water per resident each week to the roughly 30,000 households in Flint, effective immediately. The delivery was sought by a group of plaintiffs that includes Flint pastors, the liberal Natural Resources Defense Council and the ACLU of Michigan. The judge agreed with those groups that residents have encountered problems with the current distribution of bottled water from firehouses and other locations in the city, as well as with the use of tens of thousands of water filters distributed by the state. With cold weather approaching, the problems likely would worsen, he said. In siding with the plaintiffs, the judge said that a safe water supply has always been critical to civilization and that the Flint water crisis had effectively “turned back the clock” to a time when people carried water in buckets back to their homes. Anna Heaton, a spokeswoman for Republican Gov. Rick Snyder, said the state was reviewing the opinion. “In the meantime, the state will continue providing free water resources for all Flint residents, including filters and bottled water delivery for those who request it, just as we have been,” she said in a statement. Flint’s interim chief financial officer had testified in September that delivery to homes could cost $9 million a month and would devastate the cash-strapped city of nearly 100,000. The city already was projecting negative cash flow of $18.9 million in its water fund for the fiscal year ending in June. It has begun hiring contractors to dig up and replace thousands of lead service lines across the city. Flint Democratic Mayor Karen Weaver said the city would do everything it could to abide by the order while repairing its water system. “We can’t rely on bottled water forever,” she said. Since last fall, more than 40 million liters of water and more than 142,000 faucet-mounted water filters have been distributed in Flint by the state, according to Gov. Snyder’s website. Federal and state officials have said unfiltered water isn’t safe to drink yet. Some residents, including those who are elderly or have disabilities, have had problems getting water from distribution sites around the city. Others have had problems effectively using water filters. In some cases, filters can’t be attached to the plumbing in homes. “The plaintiffs have made a significant showing that at least some residents have struggled to obtain the water they need to sustain themselves,” Judge Lawson wrote. Flint’s water became contaminated after the city began using the Flint River as its water source in April 2014 and failed to add chemicals to prevent the corrosion of aging pipes and plumbing fixtures that began leaking lead into the drinking water. Residents were told in October 2015 that the city water was unsafe to drink. The city has since added orthophosphate to recoat pipes and has begun replacing old lead lines, but state data shows high lead levels persist in some areas. The water filters being distributed to residents are certified to reduce lead in water that contains 150 parts per billion of the metal. 1. Define the following as used in the article: contamination, preliminary, injunction. 2. Describe the preliminary injunction Judge Lawson issued. 3. For what reason did the judge side with the plaintiffs? 4. How did the judge explain his decision? 5. a) What is the population of Flint? How many households are there in the city? b) How much does Flint’s interim chief financial officer say delivering water to residents’ homes will cost the city? c) CHALLENGE: How much could it cost the city per person to deliver water to their homes if the chief financial officer’s estimate is accurate? 6. How is the city now addressing the lead contamination problem? 7. The contaminated water was discovered TWO YEARS ago. The majority of residents in Flint are Democrats. The former and current mayor are Democrats. The governor of Michigan is a Republican. The U.S. Department of Environmental Protection is run by Democratic President Obama’s appointees. The city mismanaged funds so switched to the river as a water source to save money. Flint’s water became contaminated after the city began using the Flint River as its water source in April 2014 and failed to add chemicals to prevent the corrosion of aging pipes and plumbing fixtures that began leaking lead into the drinking water. Residents were told in October 2015 that the city water was unsafe to drink. Why do you think the pipes in Flint still haven’t been replaced? Is this a city/state problem, or should the federal government use federal tax dollars to fund the replacement of all of Flint’s water pipes? Explain your answers. [We were curious to know how much it would cost to replace all of Flint’s water pipes and why this hasn’t been done already. Read a June 2016 Detroit Free Press article. Democratic Mayor Dayne Walling moved the city to river water to save money. Flint’s city council voted for it 7 to 1. The federal Environmental Protection Agency’s top Midwest official told The Detroit News that the agency knew about the lack of corrosion control in the water supply, after an EPA official identified problems with the drinking water, but did not make the information public. The paper also cited email exchanges between EPA officials and then-mayor Walling showing what it described as a “lack of urgency” over the matter and a greater focus on procedure rather than public safety. Mayor Walling and other officials repeatedly told residents the water was safe but blamed state and federal agencies for the problems. Walling was voted out in November 2015, with the water issue cited as a reason for his loss.